When Mario made the jump to 3D gaming in 1996 with Super Mario 64, in marked a turning point for both the Super Mario series and gaming as a whole. 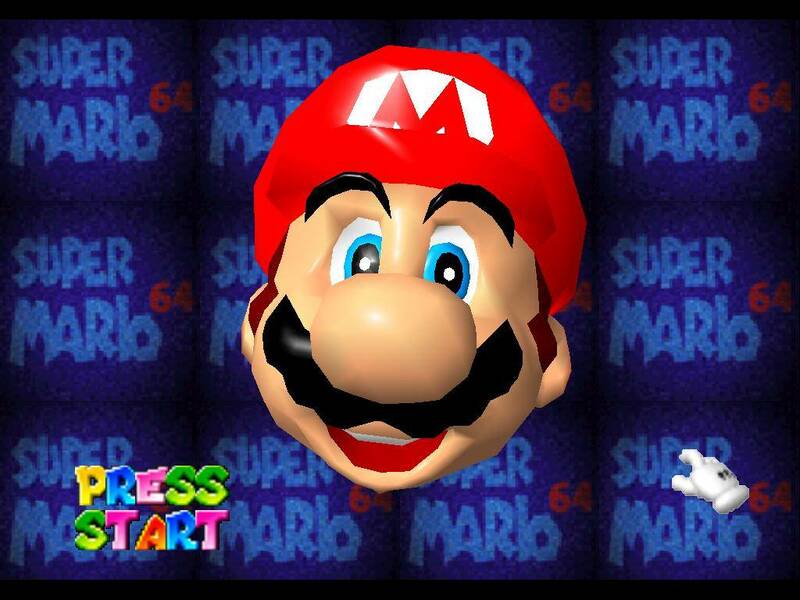 Super Mario 64 opened new doors and paved new ground for the world of video games. With such a heavy influence on gaming, it shouldn’t be too much of a surprise that the Mario series itself was particularly effected by its influence. Mario would abandon his 2D sidescrolling roots for a good ten years before New Super Mario Bros. on the Nintendo DS made it a thing again. While New Super Mario Bros. launched its own sub-series that has kept 2D Mario games largely successful, most Mario fans these days consider the 3D entries to be the “core” titles in the franchise, and with good reason. New Super Mario Bros. is fun and all, but it relies too heavily on Mario’s past and relishing in nostalgia. It’s the 3D games that feel like the series’ evolution and future. Five console games and one handheld title comprise the 3D Mario canon. While we all eagerly await what might be the next great 3D Mario adventure – whether it be a Wii U title or a key release on Nintendo’s upcoming “NX” console – let’s look back at the 3D Mario games that have been released so far. As part of my celebration of Super Mario Bros’ 30th anniversary, here is my ranking of the 3D Mario games, from least to greatest. Super Mario 3D Land is the first, and so far only, 3D Mario game released on a handheld. Because of that, it’s appropriately a smaller game. On the plus side, this means it’s 3D Mario on the go. But on the downside, it also seems like Nintendo’s ideas for the game were considerably smaller here than they were for the rest of the games on this list. 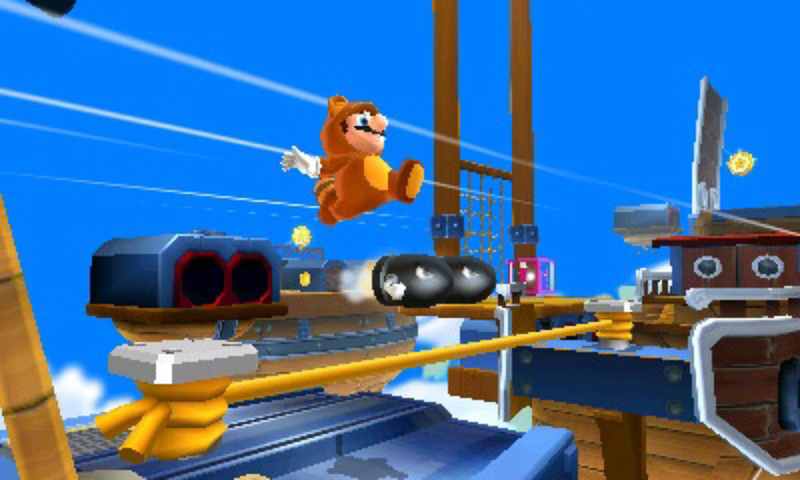 Super Mario 3D Land was Nintendo’s attempt at combining the approachability of the 2D Mario games with the gameplay of the 3D Mario titles. It was largely successful at pulling the feat off, with shorter levels that worked in a linear structure, but more robust character and camera movements. Not to mention this was the first truly great utilization of the 3DS’ 3D visual effects. What puts 3D Land at the bottom of this ranking, however, is simply that the ideas at hand feel like condensed versions of what other 3D Mario games did in the past. It lacks the sense of invention that accompanies Mario’s grander adventures. In the end it feels like a solid, entertaining platforming romp. But it lacks the creativity and wow factor that Mario games are known for. Super Mario Sunshine is not nearly as bad as its detractors would make it seem, though it also isn’t as glorious as GameCube nostalgics claim it to be, either. It is an inspired but flawed entry in the series, and it proves that the main Mario entries – much like Zelda or Mega Man – never truly disappoint, even when they disappoint. Sunshine was the second 3D Mario game, following Super Mario 64. As such, it plays things a bit closer to 64’s rulebook than the games that followed. But Sunshine didn’t merely take 64’s mechanics and levels and give them a new coat of paint. Instead it followed the most important unwritten rule of the Mario series of never making due with repeating past success. Super Mario Sunshine’s new gig was a water pack named F.L.U.D.D. 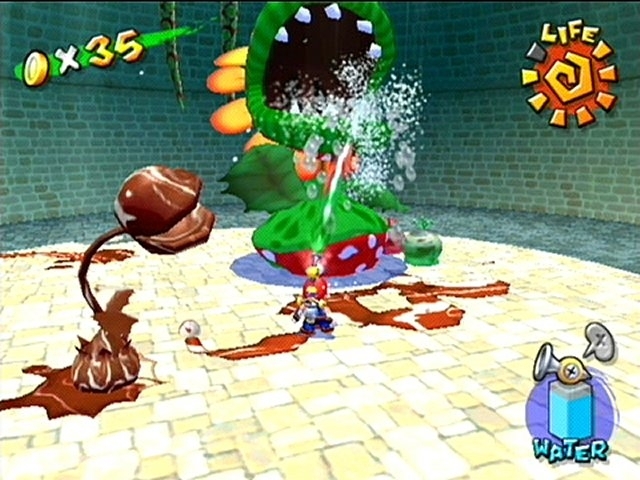 (Flash Liquidizer Ultra Dousing Device), that Mario used to clean up various goop, squirt enemies, and solve puzzles. It could even be used as a jetpack to make platforming in a 3D space easier (this being the reason Nintendo introduced the water pack in the first place). It was actually a fun gimmick, and one that I hope Nintendo returns to in one way or another (why not make it a power-up in a future game since a full-on sequel seems unlikely?). It also had a great sense of control and wonderful bonus stages where Mario lost the F.L.U.D.D. and had to rely on old school platforming. But Sunshine had two key drawbacks that prevent it from placing higher on the list. The first is that it is unquestionably the buggiest of the 3D Mario games. Mario games are usually polished to the point that you’d have to actively search for bugs and glitches to find them, but in Sunshine you may inadvertently run into a bug or two at a surprising frequency. It’s never flat-out broken, but you expect better from Mario. The other drawback – and this may just be a personal gripe – is that the game’s setting, Isle Delfino, feels pretty repetitious after a while. I respect Nintendo for making the game’s levels part of a connected place, but between the hub town, beaches, small villages, and more beaches, the world of Isle Delfino, pretty as it may be, feels relatively bland. It lacks the series’ sense of surrealism, and feels far too set in a singular motif. Super Mario Sunshine isn’t perfect then. But it still is a game that can be reflected on with respect for tackling the series in a different way. If Nintendo could expand on Sunshine’s ideas in a new game or clean up the original in a remake, it’s certainly an adventure worthy of a revisit. Super Mario 3D Land set out to merge the feeling of 2D Mario games into the world of 3D Mario. It did a pretty good job at it, but it was its quasi-sequel, Super Mario 3D World, that really nailed it. 3D World retains a similar gameplay setup as its predecessor, with linear, more compact levels that still utilize 3D space. But it’s a lot more creative and inspired than 3D Land, with some of the most ingenious level designs in the series, great new power-ups, and some of the most chaotic local multiplayer ever. Taking a cue from New Super Mario Bros. Wii, Super Mario 3D World added multiplayer into the 3D Mario formula for up to four players. Players could play as not only Mario, Luigi and Toad, but also a no-longer kidnapped Princess Peach, who returned to the role of a playable character in a platformer for the first time since Super Mario Bros. 2. You could additionally unlock Rosalina as a fifth character, whose spin attack is so useful players will argue amongst one another over who gets to play as her. What’s great about 3D World is that it truly does feel like the great 2D Mario games of the past for a new generation. I felt this game gave a closer feeling to Super Mario Bros. 3 or World than any of the New Super Mario Bros. games ever did. Super Mario 3D World doesn’t quite feel like the next step in Mario’s evolution (something that the next Mario adventure can hopefully pull off), but it is a perfect marriage of the old and new. You definitely need to get to Mario 64, Sunshine and Galaxy. 64 and Galaxy also represent Mario at his best, and though Sunshine is more flawed, it was still probably the most inventive platformer of its console generation (as much as I enjoyed Jak & Daxter, I just don’t think anyone matches Nintendo’s knowledge of platformers). It really is a shame that 3D World doesn’t get more love. It’s one of the most purely fun gaming experiences I’ve had in years. Hope you’re enjoying Mario Maker. I’m trying to rack my brain for what my next level should be, but I guess that’s all part of the fun of it. 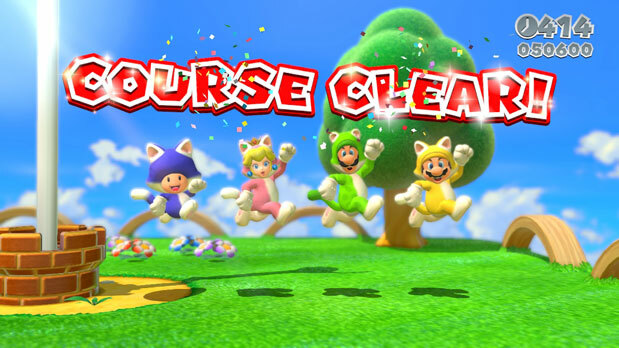 Let me think… I’ve not played enough 3D Mario games to be able to do a top 6, but I can manage a top 4 at least! For me, Sunshine has got to be at the bottom in 4th. I didn’t hate it but didn’t love it either. After that in 3rd I think the first Galaxy game, I enjoyed it a lot but found it to be too easy. I ended up loving the concepts but found myself breezing through the levels and not really appreciating them. 2nd, and it’s a big step up quality wise in my opinion, is Galaxy 2. far superior to the first game in my opinion. Subtle changes but reducing the hub world, adding more challenge, and Yoshi made the game far greater than its predecessor in almost every way. And at no. 1, Mario 64. I love it, that’s all there is to it. The music, the look, the controls, the level design. I know it has its flaws, and it wasn’t my favourite game growing up, but I absolutely love it now. That’s a respectable ranking (though I definitely recommend you give 3D World a go if you’re able to). There is something uniquely special about Super Mario 64 that, in a lot of ways, I can’t really describe. Obviously, I think the Galaxy titles are better games (particularly the second, which is “Mario World perfect”), but that doesn’t take away 64’s uniqueness and specialness. Mario’s 3D Adventures are among the best games out there. But how do the 3D Marios stack up against one another? Wizard Dojo is here to rank the 3D Mario titles to find out which one is the best of all!